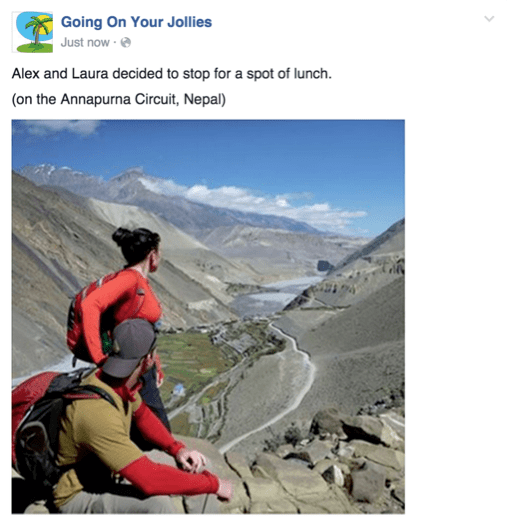 As a travel company, your Facebook page is a great way to share news and photos, inspire fans and tempt people into following their wanderlust. 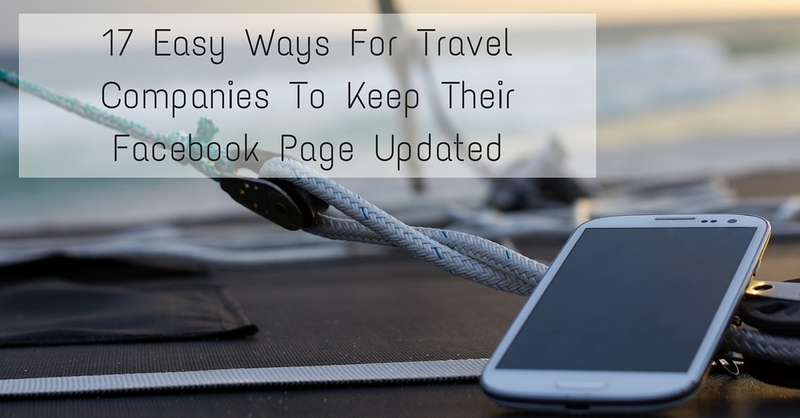 With the number of Facebook users still continuing to increase it is a platform that you can’t afford to ignore whatever kind of business you are, but especially in the travel industry. 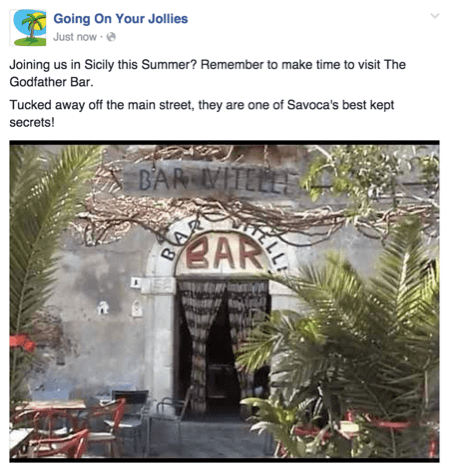 There’s no doubt about the fact that the nature of Facebook lends itself very nicely to travel marketing, and that makes it all the more important that you are participating and giving yourself the opportunity to benefit from its huge reach. The main reason we hear from clients as to why they don’t have an active page is time. “We don’t have time to spend all day on Facebook and work out what we should be posting and then actually doing it”. The reality is that if you do it cleverly, keeping an active and thriving Facebook page doesn’t have to be a hugely time consuming job, you just need to have a structured plan and stick to it. We’ve tried to make that job super easy for you by providing 17 different types of Facebook update which you can easily schedule at the start of each week that will help grow your following as well as keeping them engaged and entertained…. 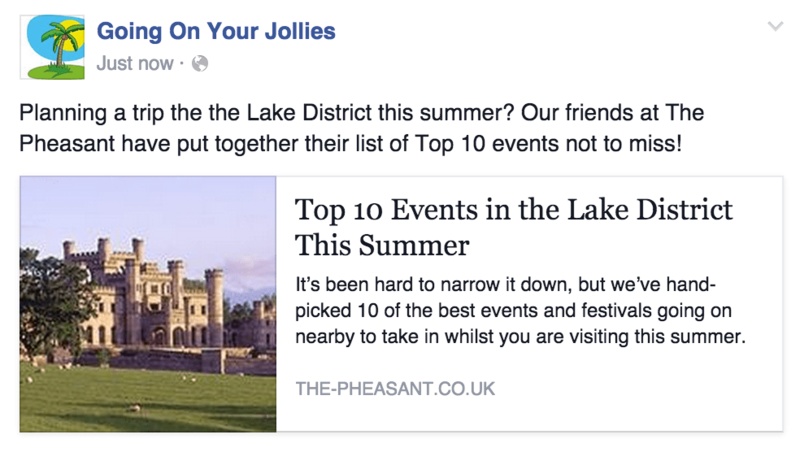 A simple Facebook post to create engagement would be to ask your audience a ‘this or that’ question. To make one of these you need to upload two photos to your status and pose the question. These can be used to make people choose between destinations, activities and even food! 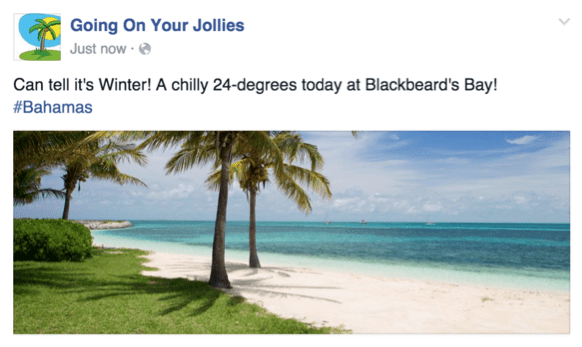 The weather is a topic that always get’s people talking and what better way to get your audience talking about it other than tempting them with a warm and sunny beach or enticing images from one of your destinations. A great way to show off landmarks near your hotels and resorts and is a great way to engage your audience. 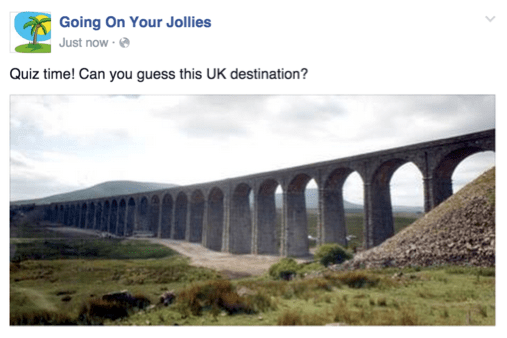 Posting a ‘Just For Fun’ Quiz regularly can create a following that comment answers each week. Remember to respond after a while to reveal the answer and congratulate those first few who guessed right! 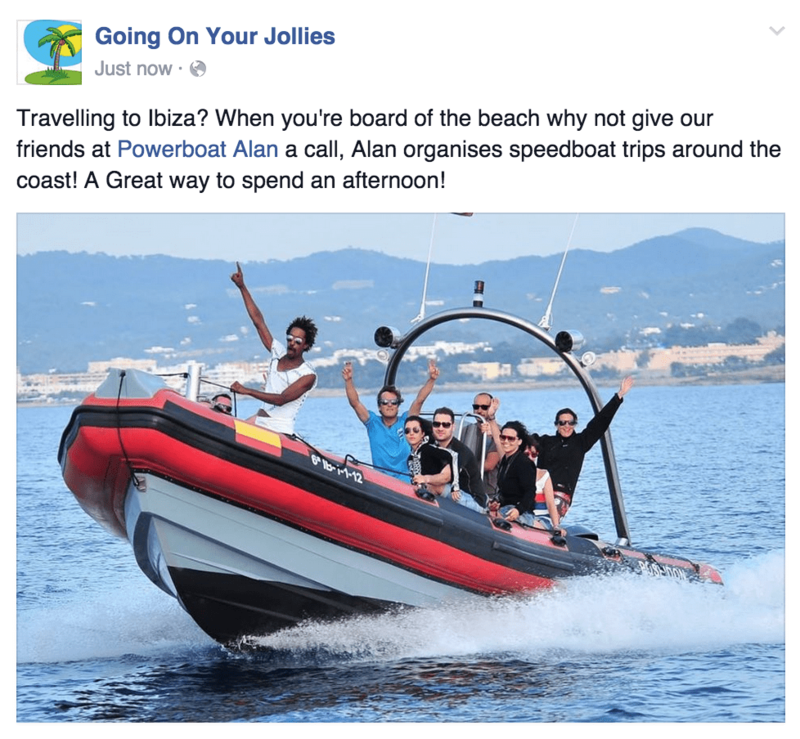 With their permission, sharing photos of holidaymakers you’re currently looking after enjoying themselves is a great way to build trust with potential holiday-goers. It also offers an opportunity to show off your hotels, resorts, local area and scenery you can offer. This will help inspire people and potentially make them interested in visiting your destinations. There are a lot of events and festivals that occur around the world and whilst some are mainstream and well known, there are many that aren’t. Share these with your audiences and create awareness of all your destinations have to offer and the vibrant activities going on there. If people are posting comments on your statuses and on your wall you should be communicating with them (and not only negative comments!). 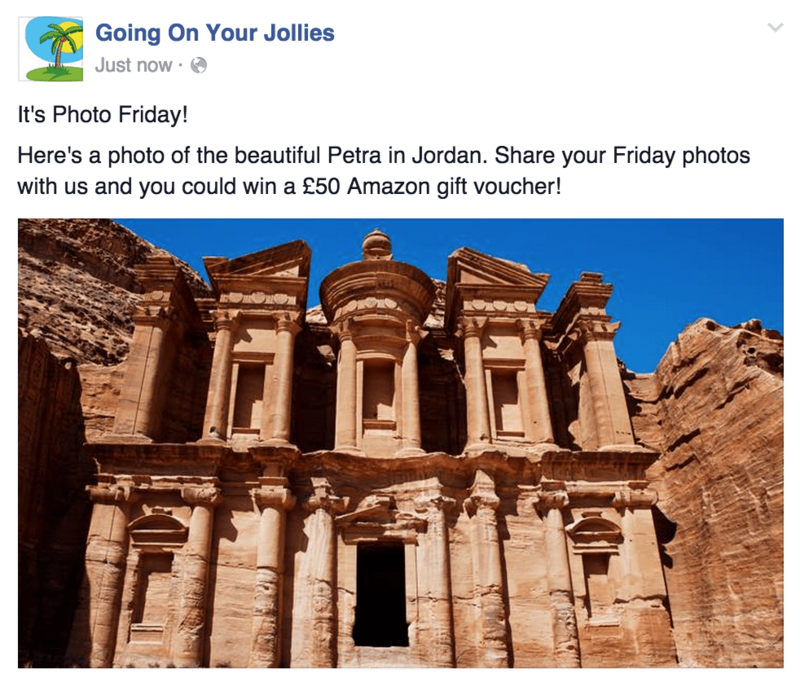 If somebody passes comment on one of your photos or posts – respond to them. Facebook can be a great customer service tool and by displaying your great customer service in the public eye you can help build trust with prospective customers. Facebook is a great place to share your latest offers and deals. When posting be brief but to the point, you want people to be interested by what you post then click onto your site to find out more. You can upload a photo with the post to show the resort or location relevant to your offer, or take the opportunity to have a little fun. 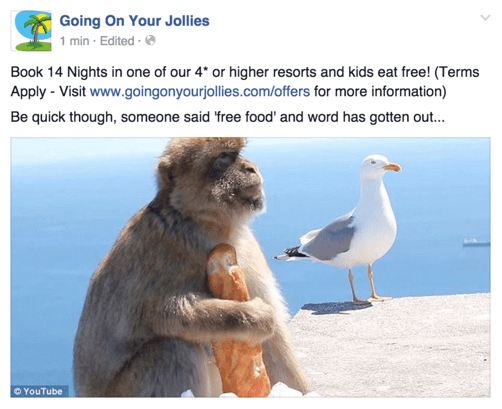 Studies have shown that its best to keep to a 9:1 ratio of great content to promotional posts, so make sure you don’t overdo it with the offers and turn off your audience! 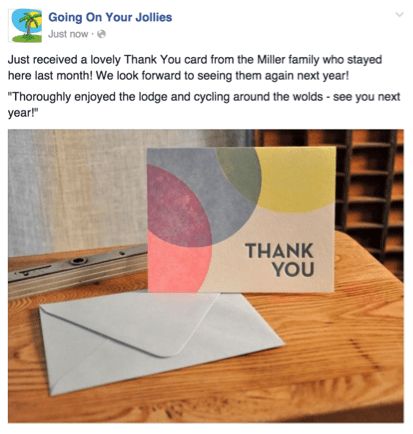 If you get thank you cards or thank you messages, share them with your Facebook audience. It’s a great way to thank your holidaymakers for being great guests and builds a relationship that will hopefully see them come back again. 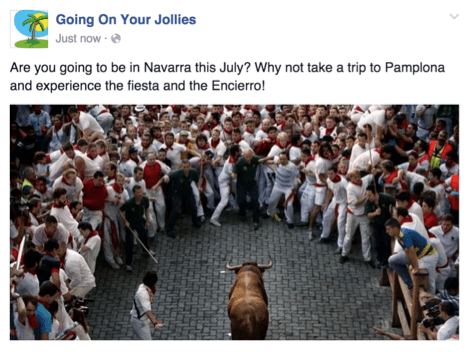 It’s also a good way to build trust with your Facebook audience and potential holidaymakers who can see that you’re a good company to work with. Holidaymakers are always looking for good places to visit on their travel, and who better to help them out than the experts! Let potential holidaymakers know about restaurants, cafes and shops that are off the beaten track that you love and you can help both inform your guests but also bolster your relationship with businesses in your local area. Customers will love you for helping uncover the hidden gems that otherwise may slip through the net, and it will demonstrate to other onlookers that you truly are experts. 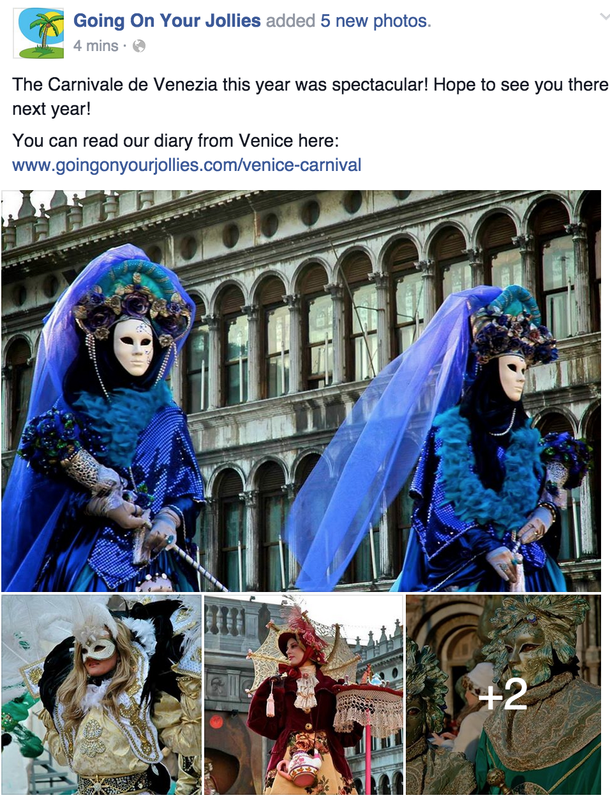 Sharing photo albums on Facebook is a great way to add content to your page as well as advertise future events. Travel is so visual that photo albums for specific locations, events or activities could help convince a fan to visit and book a trip with you. At the very least it will let your fans dream for a few minutes about where they might visit on their next trip and further build the relationship you have with them.  Engaging with your local area and community is a great way to update your Facebook as well as reinforce your position as part of the local community. Sharing local news from trustworthy websites, such as your local or regional paper can help build relationships within your local community. Sharing relevant, national news as well is a good way to get conversations started and provides useful information for your fans which isn’t promotional in anyway. 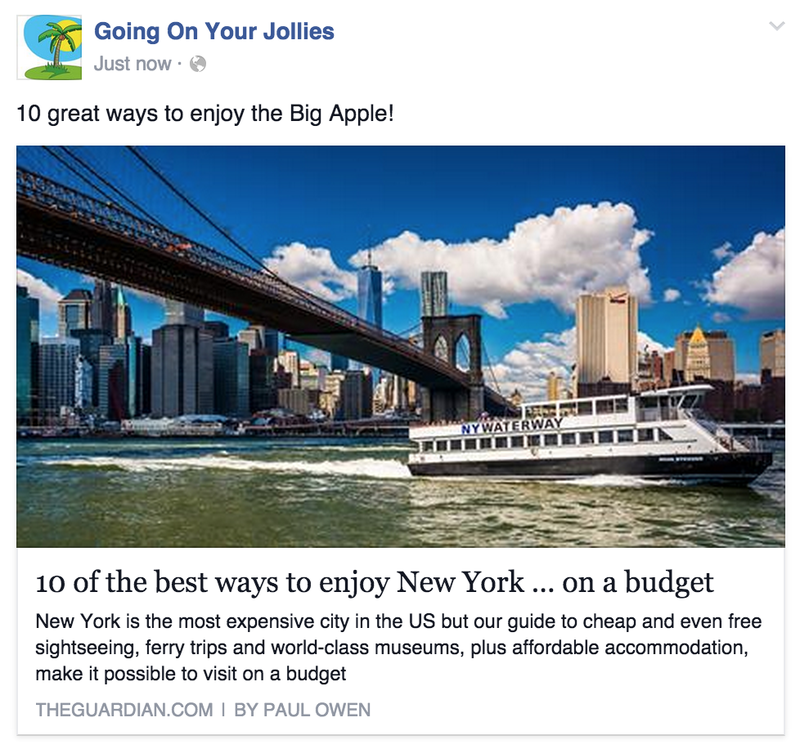 If large authoritative websites are talking positively about places your company visits then there’s no doubt that it will be persuasive for readers who are considering a trip there. 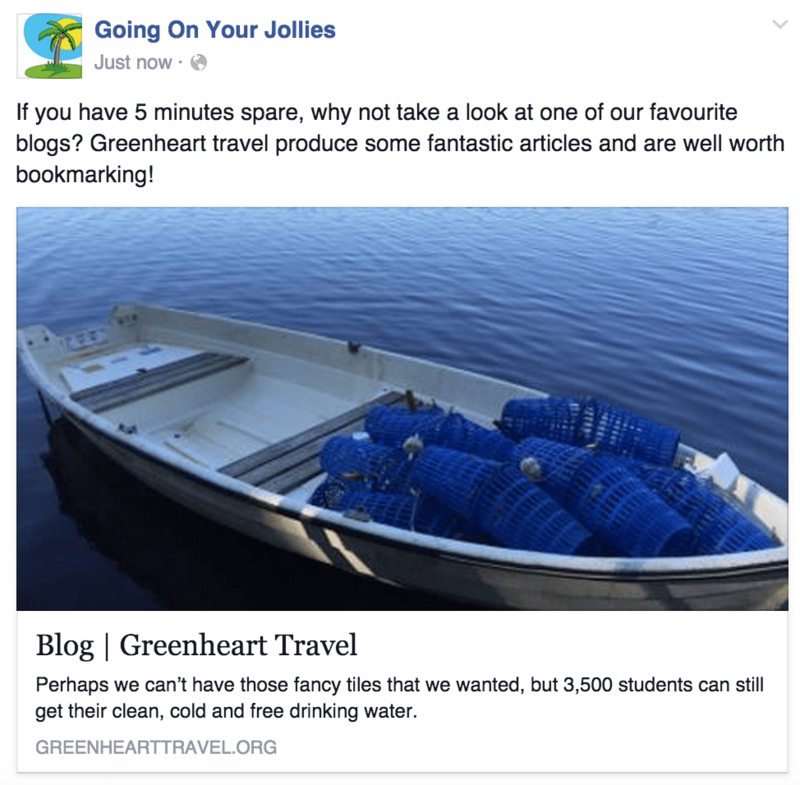 A quick and simple way to build relationships with travel bloggers, local organisations and businesses and inform your audience about upcoming events is to share blog posts that have been written by other people.  As in the exampl above, third party recommendations for places you offer further reinforce your message to potential customers. If the blogger or organisation who’s post you’re sharing is on Facebook, ensure you tag them in your status so they know you are helping promote their content which they may reciprocate at some point in the future. Do you have a favourite blogger?  Or know of a blogger who loves to blog about your local town, city, restaurant scene? Engaging with bloggers and blogs that you, your brand and your audience will resonate with is a great way to build a relationship with the blogger, and potentially gain some exposure as well as share useful recipes, news, reviews, itineraries etc with your audience. If you turn this into a regular series, like “Travel Blog Tuesday” when you promote a different blog you love it can have a hugely beneficial effect on your own visibility as people develop a relationship with your brand and bloggers become more likely to interact with you and mention you in other places. Photo series are great ways to post regularly and post content consistently with your audience. You can share historic photos of your resort/hotel, historic photos of the local town, photos of past events and even post photos of your staff (if they allow you too) and do a ‘meet the team’ feature where each week you introduce a member of your team. Another great idea is to post an image and ask your audience to post their own images in return such as favourite landscapes, flowers and food. You can also turn it into a competition (either just for fun or with a prize). Communicating with other businesses active on Facebook is a great way to build your audience, relationships and gain exposure. As well as your own competitors, there will be other businesses who are targeting the same customers but for their own products/services. Local companies such as tour operators, day trip organisers and restaurants would be good to target. The idea is that you post a status, tagging the other business in it and saying something positive about them in return for a positive endorsement back on their page. You should look to find a business of a similar Facebook audience size that is a good fit with yours so both parties get a good deal and both benefit from the increased visibility of the other’s audience.  These posts are great for engagement as well as conducting subtle market research. You can also use their answers to influence future posts, if you find a lot of people reply with the same answer you can look to tailor a future post around this answer. 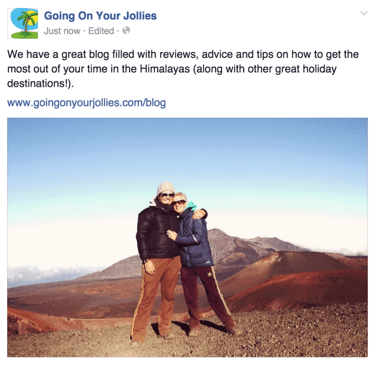 So you’ve got lots of great ideas for posts, what now? Developing a social media content calendar will help you organise the way you curate and distribute your content, as well as keep a record of what you’ve posted so you can plan ahead and develop your strategy. Being organised in this way will also save you time in the long run and helps you manage your time. 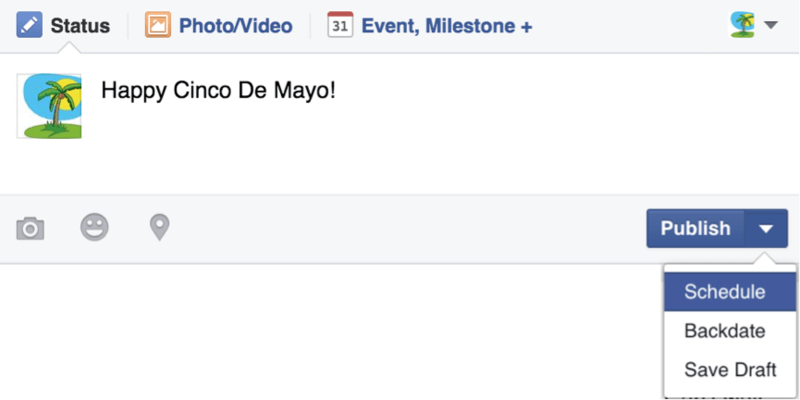 Your calendar can also be used to incorporate other social media channels and your blog. Obviously these rules don’t apply to every single post, but are interesting insights into what proves effective on the platform that you can try to stick to with some of your posts. Never stop experimenting though, as your audience may like something different to the average. 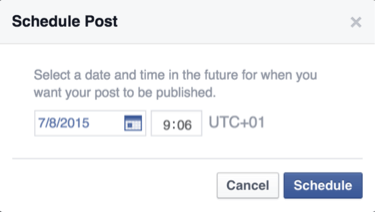 Facebook provides the option for you to schedule your posts, which means that after you’ve drawn up your plan for the week you can sit down and spend 10-15 minutes scheduling your posts.  This is a useful tool, especially for weekend posts or if you are going to be out of the office/unable to post things on the day. Finding the balance between annoying and informative can be difficult. Whilst you want to share everything going on you don’t want to bombard your Facebook audience with so many updates that they ‘switch off’ to what your brand has to say and at worst unlike your page. A survey conducted by Social Bakers has found that posting once a week is ok, but it won’t help build your audience and you run the risk of losing connection with your audience. They recommend that you should post between 5 and 10 times a week. Track social then followed up this research and concluded that you should not post more than twice a day. So there you have it! If previously you thought you didn’t have time to keep a Facebook page updated hopefully you will now think otherwise and feel motivated to put a plan like this into action. With 15 minutes to schedule all your posts, and around 45 minutes to decide what you plan to post you should be able to keep a consistently updated Facebook page using up no more than 1 hour per week. And once you get into the swing of things it will become a doddle! Don’t expect floods of Likes to pour into the page as soon as you start doing this, but if you keep this kind of strategy up consistently then over time you will accumulate a good increase in your following and form a good foundation for when you wish to invest a bit more time and effort into your Facebook campaigns.